Today is BFBN day! 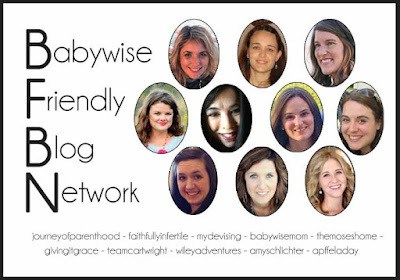 We have added quite a few new ladies to the Babywise Friendly Blog Network, so be sure to check out the blogs you know in the network and find the new ones! You will get to meet all of them on this blog in July. I’m new to the BFBN, so I’ll take a moment to introduce myself. My name is Kim, and I have been married to my wonderful husband Patrick for 6 years now. We have a 21 month old son, Ben. I am a mom who works outside of the home. I have a slightly different situation than most moms who work outside the home, in that I bring my son with me to work every day. I have been doing this since he was two and half weeks old. It works for us right now. It brings some unique challenges, and I feel like I get a taste of what stay at home moms and work out of the home moms get. I knew from the moment I was expecting my son that I would be going back to work as soon as possible. Besides being helpful to our family finances, I knew I would be happier and better able to adjust to motherhood if I was still working. I know that sounds a little counterproductive. How does going back to work right away let you handle the huge, all encompassing life change of having a baby? Well for me, it was easy. It gave me a schedule to my days. I might not have been the most efficient worker, and I might not have gotten to everything around the house that needed doing, but I had a plan. I am a person who does much better with a schedule. Even on a day off, I have a mental list of what is going to take place and when it is going to happen. When I gave birth to my son, it made sense to try to get on a schedule as soon as possible. I talked to a lot of people about schedules for babies. Unfortunately, I did not find a lot of help for my situation. Most people I talked to who worked told me that day care took care of it for them. Well, I was Ben’s daycare, so that didn’t help. The people I talked to who stayed home with their children said they generally fell into a schedule around 8 months. That was way too long to try to struggle through every day with no plan or system. So I googled away and found all sorts of information on schedules. Sadly, a lot of them only talked about schedules for older babies. I couldn’t find too much for younger ones. Fortunately, I was able to find some information on Babywise. Through that I learned about wake times, nap lengths, feeding schedules, and more. The information I learned from Babywise was very helpful at first. I learned about Eat, Play, Sleep. I learned about independent play time. I learned about setting wake times. These all helped me plan Ben’s day in a way that allowed me to work consistently, but still focus on Ben as much as possible. The one part that I wasn’t quite into was the length of time between feedings. Ben was a good eater from the start, and he grew fast. He often would be hungry long before the three hour mark. I understood the logic behind making sure babies get a full feeding, and snacking frequently does not coincide with that. I couldn’t let my little guy go hungry though. Not only did that not sit well with me as a mother, it made working impossible for me and my coworkers. I did little more online research, and sadly found a lot of information going against Babywise. Honestly, it worried me quite a bit. I read about how Babywise encouraged mothers to let their children go hungry, or that they let their babies cry for hours on end. This was not at all what I wanted to do! So I backed off Babywise a little bit. As time went on, Ben’s napping was all over the place. Fortunately, he was a good night sleeper, and as I said a hearty eater. Naps were always a toss up. I could get one good nap in the middle of the day, but that was not enough for my little guy. He was over tired and unhappy. I know for myself if I am hungry or tired, nothing is going to go right. I assumed the same is true for babies. So I decided to actually get read the Babywise book and make my own decision. Well guess what, no where in that entire book did it tell me to let my child go hungry. No where in that book did it say to leave him crying for hours. No where did it say this was the only set in stone schedule one could follow and use the Babywise principles. Instead it gave me guidelines, suggestions, and formulas to follow to work out what was best for Ben and my family. We were doing pretty well with a feeding schedule, as I had kept the idea of having a set wake up time. The next big thing was the get naps in order. I had been journaling his day in search for any pattern, and that combined with sample schedules from Babywise gave me a guide to follow. I picked a week I knew wouldn’t be too busy, and I set nap times. The first couple of days were rough. Ben was confused, and didn’t really want to nap, and generally not thrilled with what was going on. But you know what? Within five days he was on board with the nap plan. 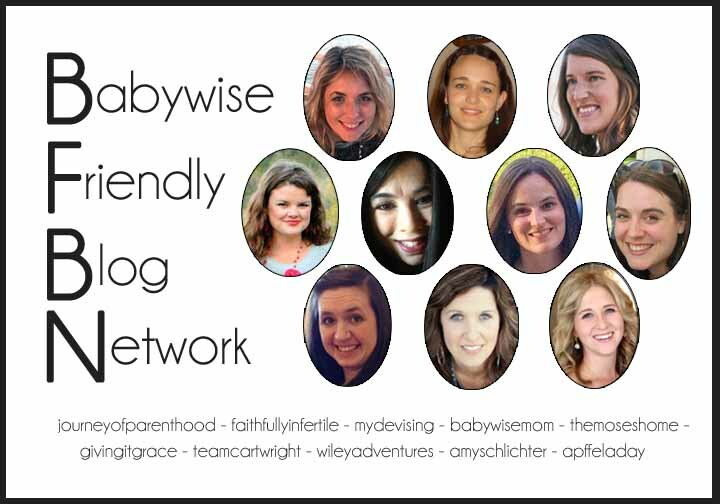 I am so glad we powered through that tougher week to get back into Babywise. Ben started being happier during wake times. He was rested. He knew what was happening, and what would happen next. He could be confident that his needs were met. And me? I was thrilled. I knew what parts of my day I could dedicate to work. I knew when I could schedule meetings, confident that I knew when nap time would happen. I could plan activities and help Ben and I both get the most out of our time. I am very happy I found and follow many of the ideas given in Babywise. I understand why it might scare some people away, given the negative press on it. One thing I noticed when I read Babywise, it never said I should ignore my maternal instincts. It also never said I had to follow everything they said to the letter and ignore everything else out there. No, it is a suggestion, a guideline, and one way to approach parenting. And you know what? It is a guide that has worked very well for me and my son. He is happy when he wakes up. He goes down for naps easily. He can play by himself when needed. He is a happy kid. I have seen him thrive with it, and plan to use the same guidelines with future children.